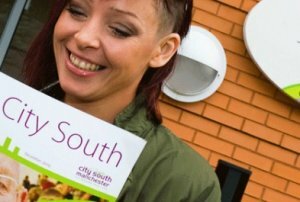 City South Manchester (CSM) was an award-winning social business providing affordable housing and community services in the Fallowfield, Hulme, Moss Side and Whalley Range areas of south Manchester. It had a stock of 4,500 properties and provided property management and grounds maintenance services. It was a member of the PlaceShapers group of community-focused housing associations. As of April 2015, CSM became part of One Manchester, a Group formed from a merger with Eastlands Homes. From 2012 to 2014, City South Manchester was looking to establish partnerships with new social enterprises and charities in Manchester and other major northern cities, as part of its evolution as a community anchor. It wanted to offer services for young people, ex-offenders, NEETs (Not in Education, Employment or Training) and people with disabilities and was keen to explore the feasibility to partner with local organisations who already offered these services rather than setting up new enterprises. Wishing not to be seen as a threat, they engaged Eastside Primetimers to broker these relationships. Partnerships were agreed with two organisations: 4CT and Bubble Enterprises. 4CT became a youth and education partner to CSM and now One Manchester, and was contracted to run a local leisure and community centre. Bubble Enterprises became an enterprise and employment partner, involved in a joint venture to support new start-up businesses, home workers, freelancers and entrepreneurs. Eastside Primetimers conducted a thorough partner search based on agreed criteria, drawing up a shortlist of seven organisations and brokering introductions. This led to successful conversations with 4CT – a small social enterprise involved in leisure & community services, volunteering and capacity-building – and Bubble Enterprises, a Community Interest Company focusing on health and training. In 2014, we facilitated more partnership discussions using the same brokerage approach but this time with local gas-fitting firms, soft facilities firms and mental health charities in Lancashire and Cheshire. If you would like to learn more about this project or our charity merger services, contact us now on 020 7250 8334 or at dawn@ep-uk.org to arrange a conversation with one of our specialists.